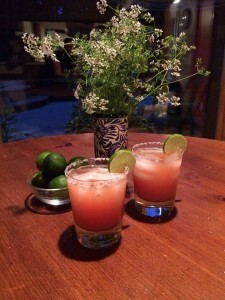 A seasonal twist on my favorite Margarita! This sweet and savory Margarita is the best of summer flavors. Be sure to take advantage of what’s growing in your yard and available at the local farmer’s markets when entertaining any time of year. 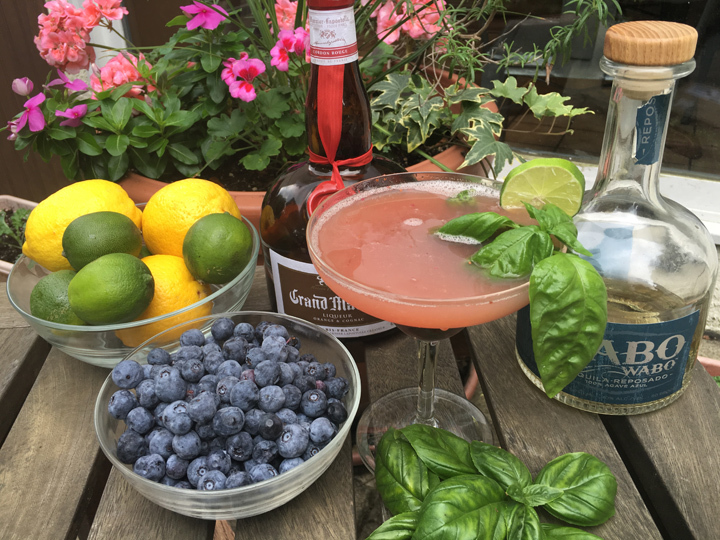 Blueberries, Basil Leaves, Fresh Lemon and Lime Juice in a cocktail shaker and muddle the berries and basil until the berries are broken down and the liquid looks purplish pink. Add the Agave Syrup, Tequila and Grand Marnier and a few ice cubes, cover and shake well. Strain as you pour into to glasses. Serve over ice or straight up. You can adjust the sweetness by carefully adding more or Agave Syrup but with very sweet berries you may need to use even less. Sip and enjoy! Winter weather has finally arrived in Philadelphia and it is time to pour my favorite hot drink – Mexican Coffee. If you have any weighty new year’s resolutions, I just read an article today that says tequila can help you to lose weight — just don’t ask about the other ingredients. Salud! 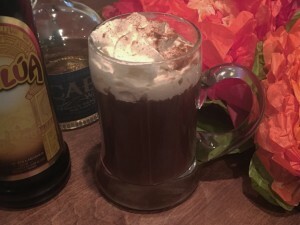 Pour Tequila and Kahlua into a large mug and fill with hot coffee. Top your drink with whipped cream. Sprinkle with Cinnamon or Chili Powder. Yes, I am drinking the Mexican Coffee in the photo now…and it is delicioso. A holiday triple treat! 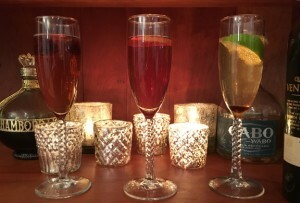 Three easy-to-make Champagne Cocktails Just in time to ring in the New Year! Pour ¼ teaspoon of Agave Syrup in the bottom of a champagne flute. Cut the lime into wedges. Squeeze one lime wedge over syrup and drop into flute, add Tequila and top with Champaign. Sabroso! Named after British naval Admiral Horatio Nelson, famous for his victories against the French during the Napoleonic Wars. Nelson led the Royal Navy to victory in the battle of Trafalgar where he unfortunately lost his life to a battle wound. It is said that Lord Nelson’s body was preserved in a cask of brandy for return to England and that his crew drank the brandy out of respect. Yuck. This homage to Lord Nelson is certainly a more pleasant and hygienic tribute. Cheers! Pour Port into the bottom of a champagne flute. Twist Lemon peel over your glass to release the lemon oils into your drink and rub the peel over the rim of your glass before dropping into the flute. Top with Champagne. Voila! Chambord Kir Royale – An elegant an easy classic! Pour Chambord into the bottom of a Champagne flute, add a few fresh Raspberries and top with Champagne. Enjoy! Wishing all of you a very, happy New Year! Celebrate safely. Drink responsibly and leave your car keys at home. 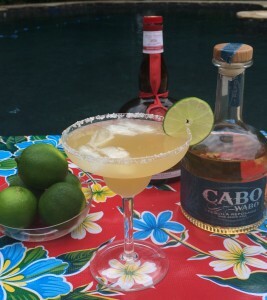 Cocktail of the Week: Margarita – my personal recipe! Great for big batches or just one delicious drink, this is the Halpern house special recipe. Wipe the rims of your glasses with the end of a sliced lime. Pour salt onto a small plate and dredge the rim of each glass through the salt to coat. Add all ingredients and ice to a shaker or large beverage container. Shake or mix well. Pour into salt-rimmed glasses. Ole! Just a reminder, Like, Share or Comment on this post to continue to keep the Cocktail of the Week coming to your newsfeed. Cocktail of the Week: Paloma! Paloma, Salty Chihuahua or Tequila and Grapefruit, whatever you call it this delicious and refreshing drink is a perfect way to cool down on a hot summer day or heat things up anytime! Cut the lime into wheels. With one of the ends of the lime, wipe the edge of the glass to moisten. Pour salt on a plate and rotate the edge of the glasses through the salt until the rim has been coated. Half fill the shaker with ice. Pour Tequila and Grapefruit over the ice. Cover and shake. Pour into two glasses. Top with a splash of club soda. Garnish with Lime. Enjoy!